Reading Australia presents this Alexis Wright podcast, with permission from The Garret Podcast. Alexis Wright is a member of the Waanyi nation of the southern highlands of the Gulf of Carpentaria. 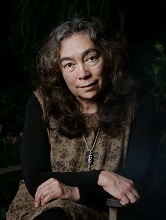 She is the first person to have won both the Miles Franklin Literary Award and the Stella Prize. Wright is a Distinguished Research Fellow at Western Sydney University. She has published the non-fiction works Take Power, an oral history of the Central Land Council, and Grog War, a study of alcohol abuse in the Northern Territory. She is a member of the Australian Research Council research project ‘Other Worlds: Forms of World Literature’, where she is focusing on forms of Aboriginal oral storytelling.